Let’s take a simple Account model as an example. When the user registers in your application, new Account is created and it’s put into new state. After registration user can request verification email to be sent, which results in changing Account’s state to unverified. Once the user clicks on the verification link, the Account becomes verified. If the user behaves badly, his Account might get suspended. Let’s also assume that the Account can be deleted, but since we don’t want to loose any data we implement soft delete pattern by simply changing the state to deleted. It means that at any given time, the Account can be in one of the following five states: new, unverified, verified, suspended and deleted. Storing current state doesn’t look like a particularly difficult problem to solve. You can store it as a string or, better yet, use enum for this purpose. Just define a list of accepted statuses in your model and you’re good to go. However, sometimes things are more complex than this. You might want to allow transitions only between some of the states. 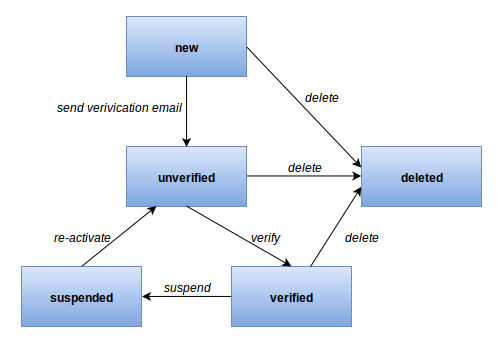 In the above example, transition to unverified might only be possible from the new and suspended state. We might also want to require user to repeat the verification process after suspended account becomes active again. We can achieve it by disabling direct transition from suspended to verified state. In addition, you might need to check some additional conditions before changing status, such as verifying credit card before activating suspended user. It’s clear that a string or enum attribute alone is not enough. We need a mechanism that will help us enforce above constraints. One of the tools that might be helpful is state machine, or more precisely finite-state machine (FSM for short). This article will introduce you to the concept of state machines. State Machine is a mathematical model of computation, used primarily for designing algorithms and electronic circuits. The diagram below shows a very simple state machine describing light bulb. The major components of state machine are captioned. At any point in time, the state machine is in one of finite number of states. When state machine receives an input it may switch to a different state. You can think of state machine as a flow chart. The act of moving from one state to another is called transition. 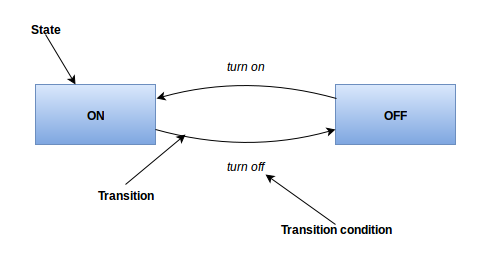 For the transition to occur, a transition condition must be met. If above description caught your attention and you would like to try using state machines in one of your applications, I have a good news for you. You don’t need to roll up your sleeves and start implementing state machine from scratch. As (almost) always, open source community has got you covered. There’s plenty of gems that you can use: State Machine, AASM or Statesman, to name a few popular choices. In the next section of this article, we will investigate the last gem from the list - the Statesman. Let’s implement the state machine for our Account model. As I mentioned above, the state machine lives in a separate class. This is great, as it will help us maintain separation of concerns between the model and state machine. The code is pretty straightforward. We list all the possible states in which the Account can be, decide which will be the initial one and define all accepted transitions. Guards should return either true or false. If the latter is returned, transition will not succeed. For a more in-depth introduction to Statesman, be sure to check out their github repository. I hope that I’ve managed to convince you that state machines can be very powerful addition to your toolset. However, it’s important to remember that the choice of tool should always be dictated by the problem you’re trying to solve. State machines, when misused, can increase the code complexity instead of reducing it. It is therefore important to weigh the complexity of all possible options before picking the right tool for the job. You shouldn’t automatically assume that every time your model has a state attribute, it must be implemented with state machine. Sometimes simpler solutions are better.